Summary: The antibody specialist delivered another outstanding set of results, as astonishing margins, robust cash production and magnificent equity returns once again underlined the group’s wonderful economics. However, matters were tempered somewhat by management remarks about the immediate revenue potential of a new product. It could mean progress during 2018 won’t be very impressive, which may leave the current 29x multiple rather exposed. I’m hoping things work out for the best, and continue to hold. Bumper interim figures followed by an upbeat trading statement had already laid the ground for an outstanding annual performance. The full-year dividend also marched higher — up 20% — with the second interim payout up 19% to 31p per share. A bonus was the declaration of a special dividend of 40p per share — equivalent to more than £2m. As promised within September’s trading update, BVXP did comment on its revenue “in more detail”. Sales of the firm’s vitamin D antibody gained 24% to £2.75m, while the aggregate turnover of five other antibodies climbed around 30% to £2.1m. I calculate BVXP’s GBP-denominated revenue may have benefitted by between 15% and 20% during the year. So perhaps the company’s underlying growth rate was between 10% and 15%. Today’s RNS introduced some caution about the recent launch of BVXP’s tropronin antibody. To recap, this particular product is supplied to Siemens and BVXP has said in the past that the antibody has the potential for “significant revenue”. Indeed, broker notes have suggested annual product sales could eventually reach £2m or more. “The rate at which this new test will be adopted by Siemens customers in hospitals in the EU, Asia and elsewhere outside the US is unfortunately not something of which we have detailed knowledge. We will develop a better understanding of this matter during 2018. While the mooted delay does not sound too worrying, there is another factor at play here. You see, revenue from the troponin product has been expected to offset the disappearing revenue from another antibody…. What with the aforementioned “education period” for troponin and the revenue gap to fill rising from £0.8m to £1m, I get the impression 2018 may actually see revenue reverse, with perhaps a notable effect on profit. Still, all is not lost just yet. Income from the company’s other antibodies continues to grow, while further progress is being made with deliveries to the group’s fledgling Chinese market. I calculate total capital expenditure has represented a microscopic 1.2% of BVXP’s aggregate operating profit during the last five years — and the £22k spent during 2017 was ludicrously tiny. Meanwhile, BVXP’s working-capital movements are somewhat larger — although absorbing a total £2.5m during the last five years does not ring alarm bells for me when operating profit has jumped from £1.8m to £5.7m throughout the same period. 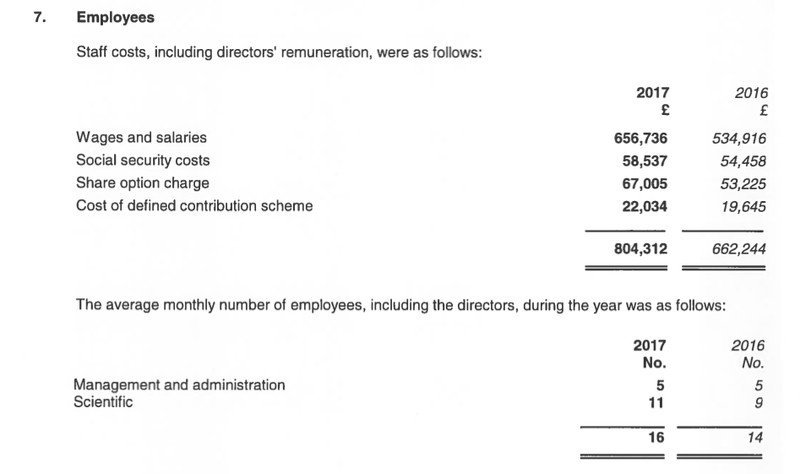 Most of BVXP’s surplus cash flow was distributed as dividends — £3.4m or 66p per share — during the year. The £0.8m left over lifted the bank balance to £6.2m or 120p per share. With few demands on cash flow, I dare say this year’s £2m/40p per share special dividend will not be the company’s last. He does like to use the word “modest”. Both times, the “modest” growth turned into 20%-plus revenue and profit advances. I just hope he is trying to under-promise and over-deliver once again. 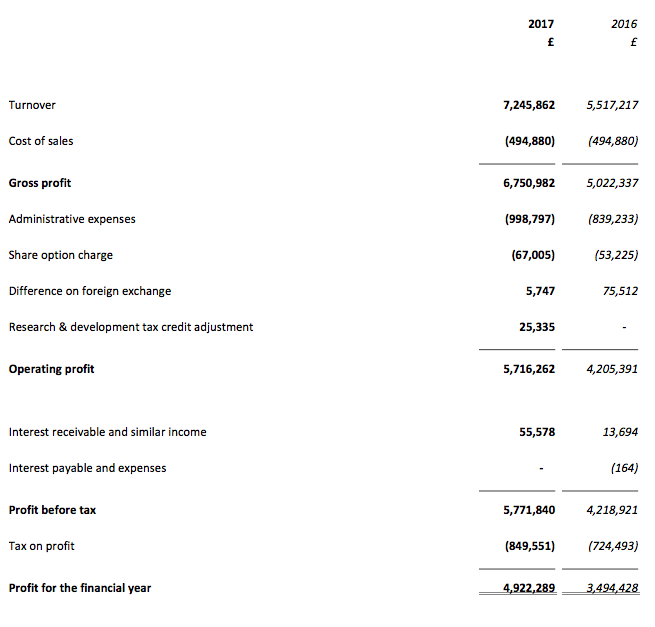 Anyway, BVXP’s operating profit before foreign-exchange differences and tax credits was £5,685k for 2017, which after standard 19% tax gives earnings of about £4.6m or approximately 90p per share. Then subtracting the 120p per share cash position from the 2,700p share price, my underlying trailing P/E comes to 2,580p/90p = 29. That multiple certainly looks racy, especially given the apparent caution expressed about the replacement of the disappearing NT proBNP income. But the wonderful economics of this business — additional revenue all seems to fall to the bottom line while only 13 people are needed to run the operation — do make BVXP a very special company. For now at least, I still have my fingers crossed that BVXP can continue to extract further growth from its vitamin D product and those five other antibodies… and that the recent Siemens troponin launch does not remain in an “education period” for too long. Prompted by a reader, I have had some further thoughts on the effect of currency movements on BVXP’s 2017 progress. This is important, as it means BVXP’s second-half performance may not have been influenced significantly by currency movements. Therefore the underlying progress seen during H2 (and the year as a whole) was much better than I had suggested in my Blog post above. For FY 2016, 32% of revenue was from Europe (EUR) and 63% was from the rest of the world (which I assume all pay in USD). So I reckon FY 2017 saw currency movements gave a c10% revenue benefit, and left 20% delivered on an underlying basis. That is somewhat better than my 10-15% guess in the Blog post above. What is notable now is that the 31% revenue gain during H2 was mostly underlying, with little currency benefit. So clearly there is some momentum within the business. And what with the regular nature of blood tests (read the PS at the end of this Comment), I feel a tad more optimistic about the upcoming revenue ‘gap’ with the loss of NT proBNP. If the vitamin D product can grow at 10% for 2018 (vs 24% for 2017), that is extra revenue of £275k, and if the other five core antibodies can grow at 20% for 2018 (vs 31% for 2018), that is extra revenue of £420k. So that comes to £695k, which leaves £305k to be found to make up the £1m revenue shortfall from the disappearance of NT proBNP. Could early Troponin sales plus any revenue advances from the R&D contract side of the business make up that £305k? Quite possibly. 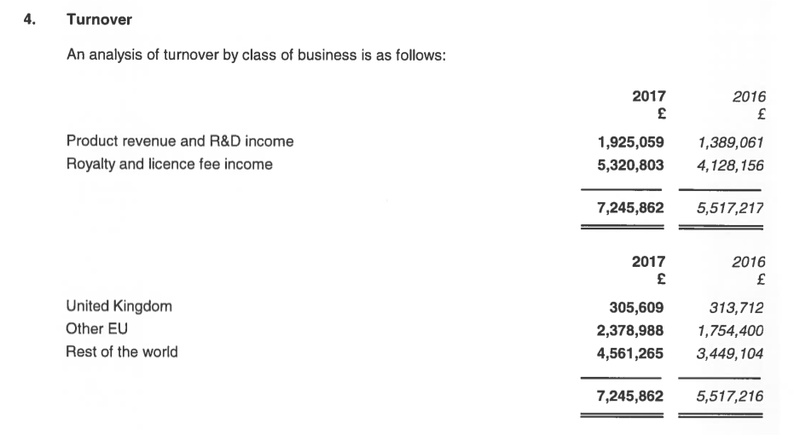 First, ‘royalty and licence income’ gained 29% while ‘product revenue and R&D income’ gained 39%. The different growth rates are not that worrying, although product/R&D income is based on direct sales/contract work and is perhaps less predictable than the royalty/licence income. The 2017 results RNS disclosed the Vitamin D antibody enjoyed royalty revenue of £2.75m, the five other core antibodies enjoyed £2.1m and the NT pro BNP product enjoyed £1m. That left £1.4m for ‘other income’. Sadly I can not exactly match these product revenue figures with the royalty/licence/direct sales/R&D revenue numbers disclosed in the annual report. I may be wrong on this, but perhaps some antibodies earn revenue from both royalties and direct sales. I see UK revenue dropped 3%, while ‘rest of EU’ and ‘rest of World’ revenue gained 36% and 32% respectively. The UK is clearly a small market to BVXP, and I am pleased there was good consistent growth outside of the domestic market. The workforce now numbers 16, and each bears a total cost of £50.3k to the group — last year the figure was £47.3k. Each employee on average generated a superb £453k of revenue for 2017, up from £394k last year and £165k in 2009. Total employee costs represented just 11% of revenue, down from 12% last year and 14%-plus from the years before. I suppose BVXP’s already stratospheric operating margin could increase even higher should the company be able to grow its revenue further and keep its employee team so small. It is not clear whether the higher pay is due to a pay rise or a notable bonus, but either way, the payment seems great value given the group’s operating profit has advanced from £1.5m to £5.7m during the last five years. It seems the three non-execs are on about £15k each. As I understand matters, BVXP carries a lot of accrued income — which reflects revenue earned during the period but where the customer had not yet been invoiced at the balance-sheet date. I believe I am right in saying that BVXP’s customers inform BVXP of their global sales after the period end, and BVXP then invoices the customers for the appropriate royalty sum. As such, the revenue to be collected is deemed to be accrued income — i.e. the revenue had not been invoiced at the balance-sheet date. Anyway, the year-end prepayment and accrued income figure for 2017 is equivalent to 53% of royalty revenue, which compares to 54% for 2016, 54% for 2015 and 52% for 2014. I am pleased the backlog of customer payments is not growing faster than royalty revenue.